Until recently, scientists have believed that only primates display "true-handedness," favoring one hand over the other. New research proves that not only do kangaroos share this trait, but that they are all left-handed. Good journalism, it is said, is knowing the right time to use a terrible pun headline. 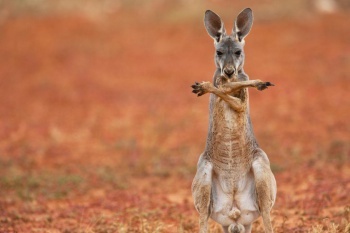 A left hook that came out of nowhere: most kangaroos are lefties, surprising new research says. This may not seem strange, but it is an unexpected trait to find in marsupials, a group very distant on the mammalian family tree from primates. Until now, we believed that only the latter group (including humans) ever showed "true"-handedess, the favoring of one hand over the other. Yegor Malashichev, a zoologist at Saint Petersburg State University in Russia, says the handedness likely developped after kangaroos starting walking upright, just as it did in humans and our closest cousins. "It seems we're no longer quite so unique," said Malashichev. The study, published in Current Biology, made hundreds of observations across several marsupial species. Two of Australia's most iconic animals, the red kangaroo and Eastern gray kangaroo, almost always use their left paws for tasks that ranged from grooming their noses, to picking leaves from trees, to bending branches. Not only does it shed light on animal brains and evolution, it also gives important insight into one of fighting games' strangest playable characters. Many animals display a "division of labor" between their two sides. The left side, controlled by the right side of the brain in vertebrates, is often assigned to everyday tasks, such as grooming and feeding; the right side, controlled by the left brain, is more for emergencies. Fleeing from danger, fighting, and so on. So why are kangaroos mostly left-handed, when nine out of ten humans are not? Paul McNeilage told National Geographic his hypothesis: the tree-dwelling ancestors of kangaroos likely favored their right hands for navigating quickly through the canopy. Modern kangaroos are southpaws because they keep the same brain structure, despite having evolved into a plains-dwelling existence. A great deal of superstition was once prevalent about left-handed people. They were thought to be witches or devilspawn; the word 'sinister,' in Latin meaning 'left,' has come to refer to maliciousness and evil. This bit of folklore has largely passed into history, but perhaps we can replace it with something more grounded in scientific truth: "if you ever meet a lefty from Australia, they are probably a kangaroo."